There is no doubt synthetic grass will beautify your home, but the most important aspect of this type of installation is the performance. Unlike many synthetic grass companies, Synthetic Grass ATX understands that pet urine can and will create unwanted odors that will turn your new synthetic lawn into an unpleasant experience. This is why it is important to make sure the urine does not bond with the turf backing. That’s why we only use the Tiger Pet System from TigerTurf™ which utilizes a five step process to drastically curtail odor issues from petscapes by focusing on aeration, drainage, neutralization and of course beauty. No longer will you have to worry about your yard falling victim to unsightly brown spots or muddy holes with our Pet Turf. Pet Turf is designed for comfort and durability. 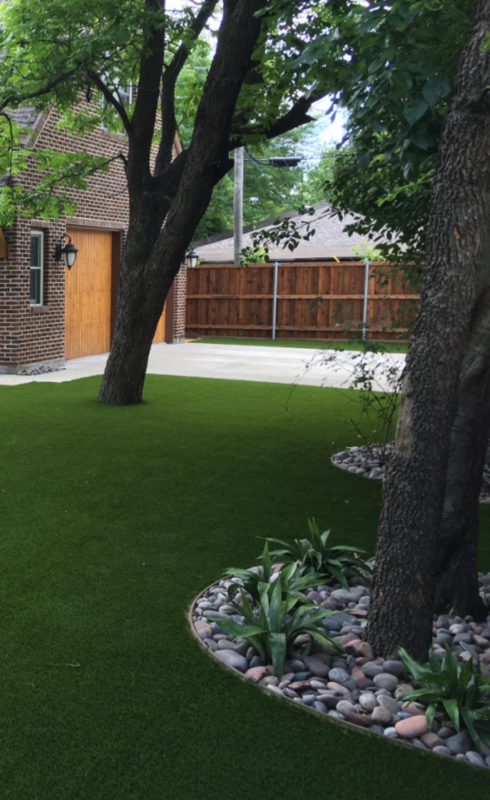 With a coated polyurethane backing, Pet Turf can withstand moderate to heavy foot traffic, rough play and consistent stress. Just because it’s designed for pets does not mean it won’t impress humans. Like all of our turf, Pet Turf looks and feels identical to natural grass and stays green all year long. It really offers the best of both worlds! We offer a “pet package” that include a pet turf with an infill system that eliminates pet odors. Each step of our petscape system compliments the other to create the perfect combination for great looking and fresh smelling artificial grass. From our antibacterial Durafill, urine neutralizing ATD, UV stabilized Pet Turf, perforated Drain Core to our non-toxic Turf Fresh this system was designed to meet the needs of pet owners. Whether you have one small pet or a whole family of large animals the Turf Core Drain System is exactly what you need. All of the petscape products in our system have been tested and are safe–not only for your pet but also the environment and for you.